Wearing a harness while climbing or in dangerous situations can save ones life. In this two minute video we will show you how to properly assemble and wear a harness. 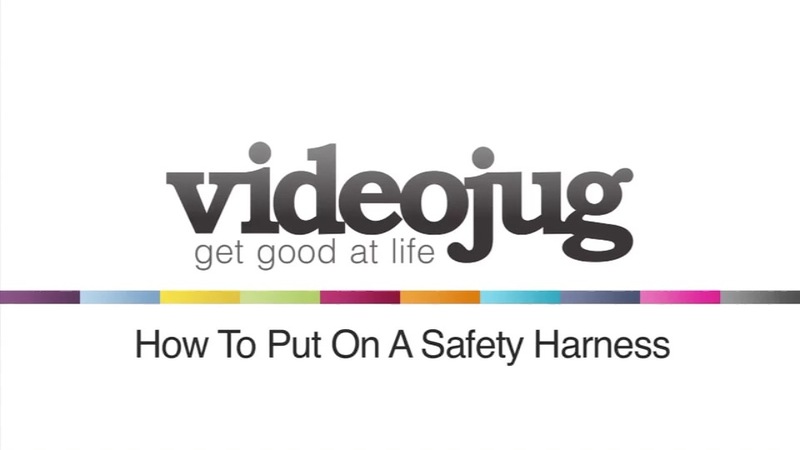 In this video, we’re going to show you how to put a safety harness on. I’ll just show you a few aspects of the harness, first of all. Okay, this part in front here is where your legs go so, your left leg will go in here. Your right leg here. You right arm and your left arm here. Feeding up, is the carabiner. What you do is you attach this onto any bit of equipment you’re using. An idea is if you’re using a cherry picker, you’d click it onto the cherry picker, lock your arm, and tighten this piece up here so it’s locked in position. What its got, its got slow release-it’s called a slow release harness. What this means is, if you did accidentally fall out of the cherry picker this would slow release you and drop you down by about two meters. Okay, my assistant here is going to put it on and I’m going to show you how it goes together. So, just put your leg in there. That’s it, right leg here, left leg in here. What you do is you pull it up and these parts will go in between the groin. Okay, my assistant just holds this for me and that goes over there-and just hold this part here. We’ll put this part over here. Okay, this part in the middle what it does is it just simply stretch through there. And that locks in. The next thing that you need to do is you need to adjust the harness to were you need it. So obviously, depending on the size of you, if you are big or small. You can do that there and there and there’s two straps on the side there that you can adjust as well. Okay? And that’s how to put a harness on.